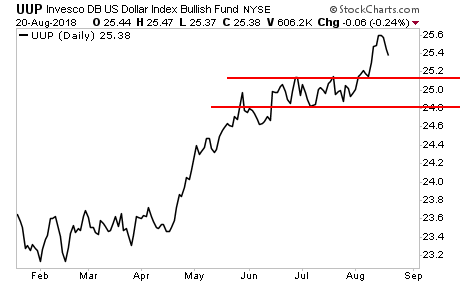 Yesterday we noted that the $USD had fooled 98% of investors into believing a bull market was underway. The $USD had done this via a “false breakout” to the upside. That process is now reversing. And the ensuing collapse will be violent. Yesterday, we noted that one of the primary reasons for the coming $USD weakness is the fact that the US and China were about to sign a trade deal. 1) The Trump White House is openly calling for a weaker $USD. 2) Going long the $USD is now the most crowded trade on the planet. Regarding #1, yesterday at a fundraiser President Trump complained that Fed Chair Jerome Powell hadn’t proved to be an “easy money” Fed Chair. He also commented that he would continue criticizing the Fed if it continued raising rates. Regarding #2, traders are now more long the $USD than at any point in history. Going long the $USD is the most crowded trade on the planet. Which means there is a LOT of leveraged, hot money crowded into this trade. So the $USD is now in an extremely dangerous technical formation… at a time when the White House is openly calling for the $USD to go lower… and a RECORD number of traders are LONG the $USD. These are the situations from which VIOLENT reversals are made in the markets. The fact is that while everyone is focusing on the near-term, in the long-term the $USD is forming a clear Head and Shoulders top. That’s a heck of a “tell” from the markets. 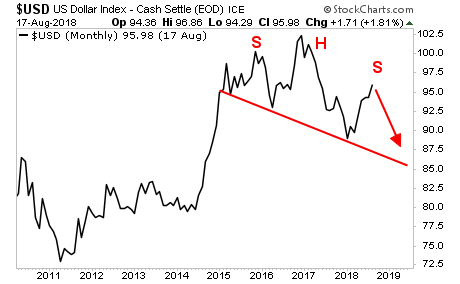 And it's "telling" us that we're about to see a major inflationary move as the $USD drops hard. We are making just 99 copies available to the public.